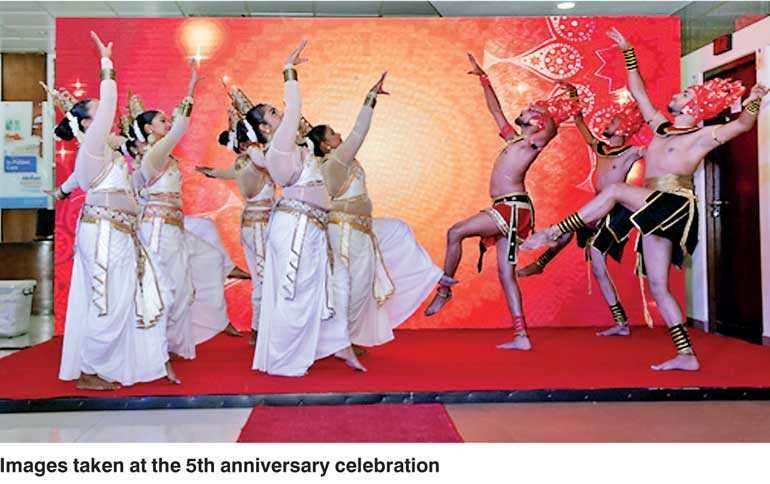 Marking five years of exceptional healthcare services, Hemas Hospital Thalawathugoda, part of the leading multi-chain of Hemas Hospitals celebrated the milestone anniversary with a series of events themed ‘Pranamaya’ to pay tribute to the many stakeholders that were part of the journey. The hospital management organised a special event with the participation of Steven Enderby, Group CEO of Hemas Group as the Chief Guest to honour 90 staff members who completed five years of service to the hospital. A host of other senior dignitaries of the Company graced the occasion which felicitated the staff members with valuable gifts and certificates. In addition to the line-up of events, Hemas Hospital Thalawathugoda organised a poster competition and a creative writing competition in celebration of its numerous achievements and unwavering success throughout the five years. “On this day, as I look back on our journey and the positive feedback we received from our consultants and patients I am humbled by the magnitude of service excellence we have been able to provide. Through the healthcare services we provide at our Wattala, Thalawathigoda and Galle hospitals as well as the diagnostic services offered at our 47 laboratories spread island wide, we have become a leading hospital chain while simultaneously elevating the overall standard of healthcare services offered in the entire country. At one point in the past, both government and private healthcare service providers showed a lack of understanding about standardisation and quality control. We succeed in changing that status quo by becoming the first hospital chain in Sri Lanka to obtain the prestigious and globally renowned Australian Council of Healthcare Standards International (ACHSI) accreditation. This raised the bar in providing healthcare services in Sri Lanka, an accomplishment in which we take pride,” commented Managing Director of the chain Dr. Lakith Peiris. Throughout the past five years Hemas Thalawathugoda has been consistently elevating all aspects of services including raising standards to comply with national and international standards, enhancing collective medical expertise, upgrading facilities to be on par with global standards and providing warmth and personal care to patients. Within five short years, Hemas Hospital Thalawathugoda obtained numerous international validations and accolades including the prestigious Australian Council of Healthcare Standards International (ACHSI) accreditation which the hospital obtained during the first year itself. Among the many awards and accolades accumulated over the five years are the gold standard ISO 15189:2012 accreditation for the laboratory, OHSAS 18001 accreditation for Occupational Health and Safety and the recognition that the hospital received for maintaining stringent safety practices as the best in class at the National Institute of Occupational Safety and Health (NIOSH) award for occupational health and safety. Moreover, the hospital succeeded in implementing an organ transplant programme recording a 100 percent success rate. Hemas Hospital Thalawathugoda also obtained clinical excellence within the past five years, in particular in the surgical capability hence entering the big league in medical care within a short span of time. The Hospital’s medical tourism program too gained recognition and trust of many foreign patients within a short period of time. “On this day that we celebrate our fifth anniversary, I would like to express my sincere appreciation and gratitude to our dedicated staff for their determination and care which they use to serve patients day and night. Our staff remains our core strength. They are the true heroes who save lives and provide care to patients when they need it most. I would also like to show my gratitude to our panel of consultant doctors who work just as hard,” added Dr. Peiris. In line with the ‘Pranamaya’ theme, in addition to paying tribute to hospital staff, the hospital management paid tribute to the other valued stakeholders including consultant specialists, customers as well as the general public in the area. 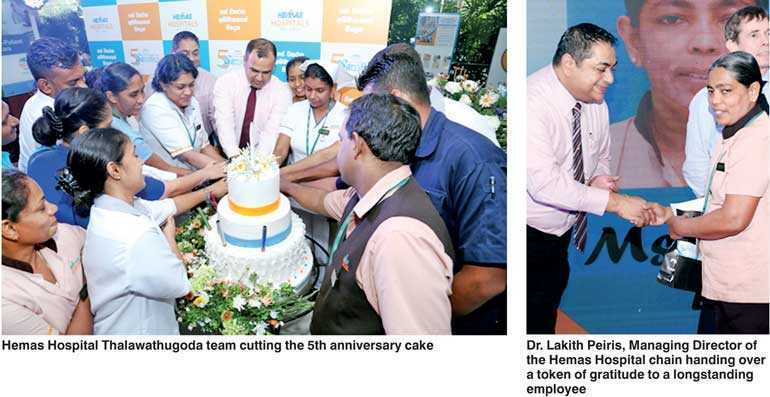 As part of the five year celebrations, Hemas Hospital Thalawathugoda provided free clinics in several specialties, namely; surgery, urology, paediatrics and ENT as well as free OPD consultation during designated times of the day. In addition, the Thalawathogoda community was also invited to benefit from consultation with dieticians free of charge. The Hospital also provided a special screening package at a discounted rate and conducted a free health camp in Kaduwela. On the day of the fifth anniversary, all inpatients received gifts from the hospital management. “We have been defining healthcare services for the past five years at our Thalawathugoda hospital and we will continue to enhance our service level to reinforce our leadership stance,” summed up Dr. Peiris.